Some of you may know that I am not a real food blogger – and by real I mean a person who does food blogging, recipe development, food photography and cookbook writing full time. I started blogging about two years ago as a way to share some of the recipes I’ve been enjoying. For me, this was a way to combine my love for cooking and my love for writing. But: I do have another huge love in my life, one that overshadow all else, and it is love of science, especially the kind of science done at the interface of chemistry and biology. So, my real job is guiding one of the best chemical biology programs on the planet. This job comes with an opportunity to travel to meet other scientists in the field, so we can share and learn from each other. Recently, I went on a trip which scientifically I enjoyed very much! However, the plane rides were bumpy, and they were delays, and stress, and long flights, and really limited food options at the airports. Which means that for couple of days my diet was OK, but not great. Plus: I tend to eat too much when I travel. Snacking helps pass the time, and although I know it is not healthy, it is what I do. By the time I get back home, I am usually beyond exhausted sometimes due to the trip itself, but oftentimes because the amounts of salt, fat and sugar I consumed. That’s why I developed this wonderful smoothie to help me reboot and rebalance myself. The smoothie comes together in a snap, like they all do, and uses blueberries, bananas, oatmeal and peanut butter powder. The peanut butter powder is something that you can now find in your local grocery store. It is made from roasted peanuts after all the oil haas been removed, which means that it has less calories and less fat, but more protein per serving than peanut butter. This powder retains all of the peanut aroma, and you can use it for smoothies, baking and even cooking things like Pad Thai. I like using it in this smoothie because it adds a nice punch of protein to it. Bananas are an essential smoothie ingredient, no matter what. They add sweetness and creaminess to it, and make the smoothies rich, so much so that you will think you are getting spoiled. If you do not like bananas, this smoothie can be made with roasted sweet potatoes (yummy! ), and even canned pumpkin purée. Bananas are full of vitamin B6, which is the essential cofactor of many enzymes that regulate our metabolism, and when it comes to vitamin B6 one banana goes a long way (more than 30% of your daily value)! Blueberries are also key to the final flavor, and I recommend that, if you can, get frozen wild blueberries, preferably from Maine. This, of course may not be possible where you live so you can use any blueberries you have on hand, or strawberries, raspberries, blackberries or sweet cherries for that matter. The fruit you use can certainly be bought frozen, and I do this all the time as it ensures I have perfect fruit ready to go for whenever I need a smoothie. You can also use fresh in which case you may want to add a couple of ice cubes into your smoothie mix before blending if you prefer your smoothies icy cold. Finally, just a bit of oatmeal will enhance the creaminess, and add more sustaining power to the smoothie. One serving will fuel you for a while! One note on the blenders and the order in which you add the ingredients. Some of you may have industrial strength blenders that can handle anything. The one I have is good, but not fantastic and for my blender to work well I have to add liquids first, then things that are softer, then things that are harder. The order below is based on this principle, and you don’t need to follow it unless you have the kind of finicky blender I have. Place the almond milk, chopped banana, blueberries, oatmeal and peanut butter powder into a blender. Close the lid and blend until smooth. Let the blended mix sit for about 10 minutes to allow the oatmeal to soak and soften. Then pour it out and enjoy! It’s a bit ridiculous to share a smoothie recipe like it is a thing. After all, smoothie is nothing more than throwing couple of things in a blender and pressing a button. But, I’ve now made this version a few times, never straying from the original recipe and it is a keeper. Even people who usually refuse to drink almond milk were able to get behind this one, so I decided to share it with the world. The recipe is super fast, super easy, super cheap, super convenient – all in a real superlative fest! 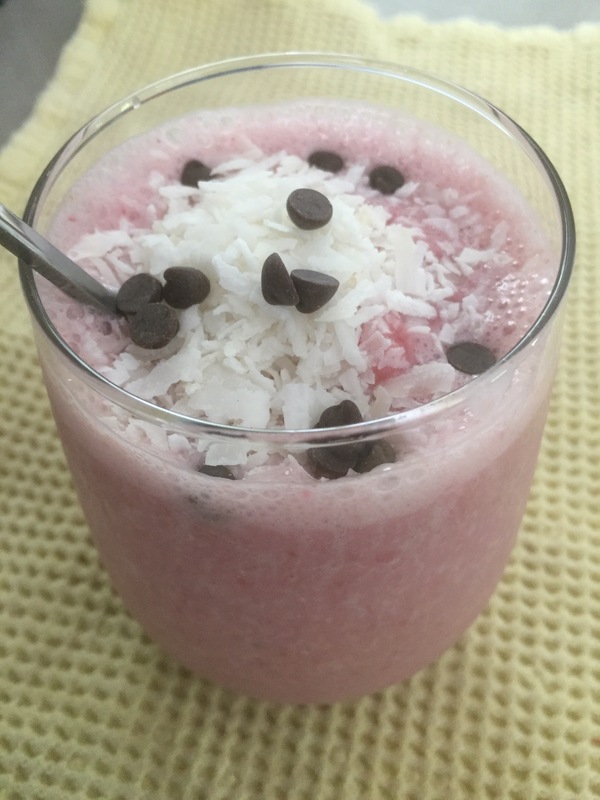 All you need is a banana, five frozen strawberries, some almond milk, preferably unsweetened and vanilla flavored, a dash of unsweetened coconut flakes and a sprinkle of vegan mini chocolate chips. These last two ingredients are completely optional but they do elevate this smoothie to the seventh heaven. I do recommend using frozen whole strawberries. First of all, they have great flavor all year round as most brands use the best looking whole strawberries for freezing. Note that you should stay away from chopped frozen strawberries because I am not so sure that you can tell what those looked likes before they were chopped, and you should definitely check that strawberries are the only ingredient in the bag, just to be on the safe side. Frozen whole strawberries are usually cheaper than fresh, and they are really handy to have on hand in your freezer to use for smoothies, or other recipes. For the purpose of this recipe you can definitely use fresh strawberries if you have some. In that case you may want to add an ice cube or two, if you like your smoothie cold. The benefit of using frozen strawberries is that no extra ice is needed – they give this smoothie a nice, subtle chill that is just fabulous for summer breakfast at home or on the go. Final note for those who like a sturdier breakfast. This smoothie is light, has no added sugar and a minimal amount of fat that comes from the almond milk, coconut flakes and the mini chocolate chips. If you want to make this smoothie thicker and more filling, you can simply add two to three spoonfuls of rolled oats. If you are adding oats, I recommend you letting the smoothie rest for five minutes or so before enjoying to let the oats soften just a smidge. Place chopped banana, strawberries and almond milk into a blender. If you are using oats add them now. Blend until smooth and to consistency you like. Pour into a glass or a travel jug if you are taking it on the road. Sprinkle coconut flakes and chocolate chips and walk into the sunlight, figuratively and/or literally! First time I had cheesecake I was twenty five! Yes, it’s true – I spent the first twenty five years of my life in a blissful ignorance, completely unaware that cheesecakes existed. But, soon after moving to US I did partake on a slice and fell in love immediately and over the years things just better and better. First of all, cheesecakes are easy to make. They are also very versatile because you can customize them in many different ways. I used to make pumpkin cheesecake topped with baked apples and pecan caramel for Thanksgiving because pumpkin pie is sort of boring. My other favorite cheesecake I used to make was plain vanilla topped with homemade blueberry syrup. So one night, as I was making myself a light dessert of blueberry smoothie, I got inspired to try and make Cheesecake 2.0 – the 21st century version that is dairy-free, gluten-free, and egg-free. So, when I discovered that agar has a culinary application I was skeptical. But when I thought about what I need agar to do – act as a jelling agent in the same way gelatin would – I concluded that my skepticism was not founded in reality and chemical facts but some silly prejudice. Thus, I bought a small jar of agar powder and I’ve been using it to make hard (and shreddable) cheese quite successfully. In this recipe I took agar powder a step further and used it as the firming agent for the cheesecake. It did the trick and the result was a yummy cake with excellent smooth yet firm texture. Use a grinder or a food processor to grind walnuts and cashews to a relatively fine meal. Pour the ground nuts into an 8 to 9 in (20 to 23 cm) round springform pan. Add brown sugar and mix well. Add melted vegan butter (30 sec in a microwave should be enough to melt this amount) and using your fingers mix the melted butter in so that all of your nut and sugar mix is moist. Press the mix into the bottom of the pan to form a crust. Set aside. In a large blender mix almond milk, blueberries and oatmeal until smooth. To prepare agar powder, bring 2 cups of water to boil and add the agar. Use a whisk to mix everything together lower the heat to simmer and keep mixing and simmering for 4 to 5 minutes. Add hot agar to the blender in small batches, 1/2 cup at a time. Pause to incorporate then add more until the entire amount of agar is incorporated. Pour the filling into the springform pan and use a spatula or a flat spoon to spread around and flatten the top. Refrigerate for at least 4 hours, best overnight. Pop it out of the springform pan, cut and serve as is, or with fruit and/or vegan whip cream. I made one from chickpea water (aquafaba), but you can make any one you like or skip it!